No computer, no mouse, no keyboard, no cables, just an iPad, an iPhone. That seems to be a minimalistic configuration for blogging and doing all the other things where an electronic device is a bit more comfortable than a pen, sheets of paper, card boxes, and postage stamps. This time I want to talk about blogging on WordPress, the biggest free blogging platform in the world, with a minimalistic configuration supported by Apple’s ecosystem. I use this hardware configuration at home and the iPhone on-the-go and at home as a second screen. All mentioned apps are so-called ‘universal’ apps that means you download once from Apple’s AppStore and the apps are installed across all devices which are configured with the same Apple ID. All my apps are able to connect to cloud storages so that information can be accessed from the iPad as well as the iPhone when on-the-go. Additionally they keep the data in the local app folders, an indispensable requirement. WordPress, PlainText, iThoughts, and Keynote, the essential apps for blogging, save their files automatically in their local documents folder. This allows working even if an internet connection is temporarily not available. Syncing is automatically done if the iOS device reconnects. Essential data are synced with Dropbox (supported by most of the apps in Apple’s app store) and additionally with Box to increase data security (redundant storages). Unfortunately Dropbox still doesn’t allow WebDAV access which is required when saving iWork documents on an other storage than iCloud. So my second cloud provider is Box (for personal use, 10GB free, perfect UI and features available in the iOS app, perfect content sharing platform, available since 2005). Box supports WebDAV so iWork documents can alternatively saved on Box from within all iWork apps by using the command ‘Copy to WebDAV’. All apps are developed by reliable companies and offer regular updates and feature extensions as well as adaption to major changes of the operating system like Apple’s update of iOS in Sep 2013. This app is used to finally create the textual and formatted part of a blogpost with added images or videos. It also manages the WordPress database where your posts are stored. Posts can be saved as drafts for further editing, published immediately (even via E-Mail sent to WordPress), or scheduled. Powerful stats give you an overview of the number of visitors from each country, followers, referrers, search engine terms, top posts and pages, clicks, tags, and categories you assigned to your posts. Backups of the whole blog data can be made by exporting an the database contents as an XML file. It’s recommended to activate Akismet (a subsidiary of WordPress) to keep your blog clean of spam comments. 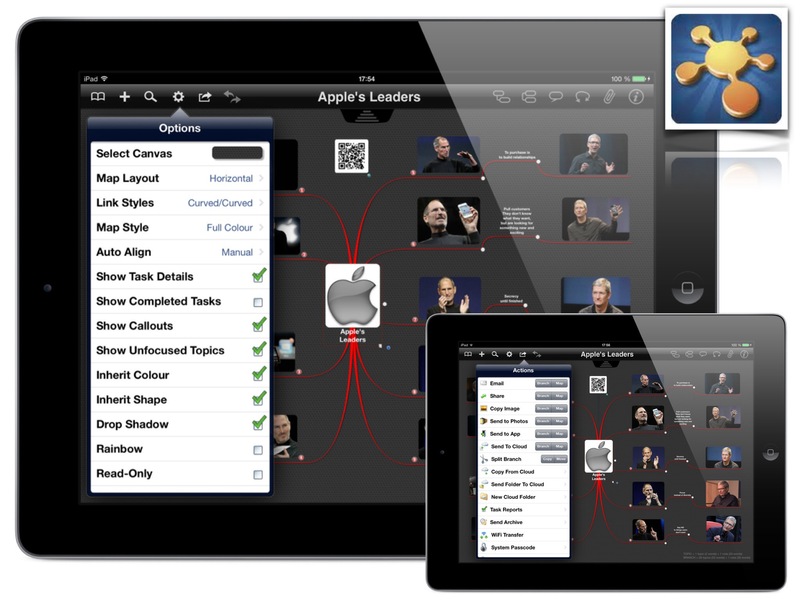 There is no other comparable app for creating presentations on mobiles like Apple’s Keynote, part of the iWork Suite. With Keynote I create all the images you see in my blogs as well as images for social networks. Creating an image in Keynote is a funny task. Collages created with images (e.g. screenshots of running apps on your device), added text and symbols, varying opacities, and connecting lines breath life into your post. And it’s all synced with your other iOS devices via iCloud. Take this mind mapping tool for brainstorming, feature descriptions, or all other kind of information which should be summarized visually. Using a database is the right way to keep different information together. With Tap Forms I manage all posts, post intros for sharing on social networks, images, and links. This is also done automatically by WordPress but the iOS app lacks because some useful features covered by my database are only available via a browser which, in some cases, is a quite painful way to access essential information about posts. Don’t care about formatting. This can be done later. Content is essential and content doesn’t need bells and whistles but a running brain. 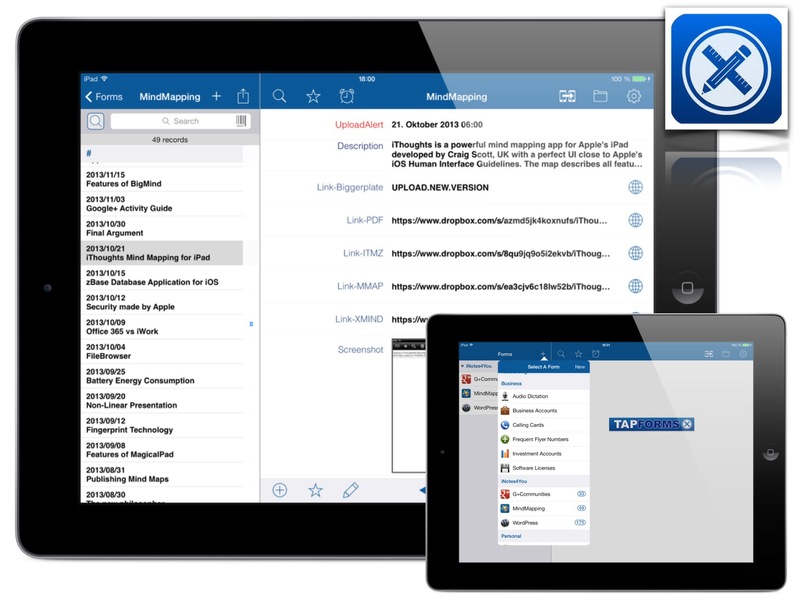 To keep the mobility the editor should be connected to a cloud storage so that editing can be continued anytime, everywhere with one of the two devices. PlainText is connected to the cloud storage Dropbox as well as iCloud and automatically saves edited text in the cloud. Just write what’s in your mind, the rest is managed by the app. 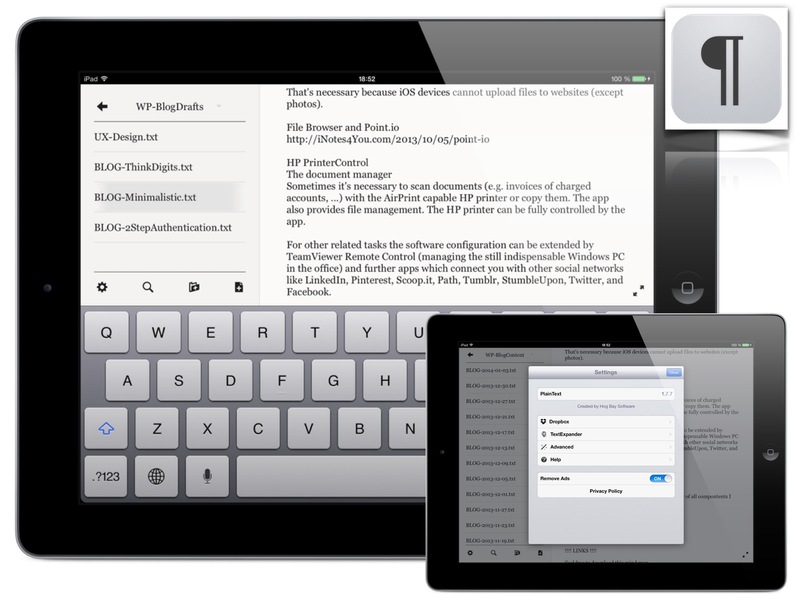 As an alternative I recommend the app ByWord which supports Markdown. The app can be updated so that text can easily posted to WordPress, Tumblr, Blogger, Scriptogram, and Evernote. Simple text editing for users aged from 4-104. The first text editors were Line Editors oriented to teleprinter- or typewriter- style terminals without a display. On some line editors, the cursor could be moved by commands! Line editors drastically improved text editing. In 1982 the Personal Editor was developed for PC DOS, the IBM operating system for their first personal computers like IBM PC, XT, or AT. are a perfect way to quickly write down a basic idea for further platform-independent usage with all other apps like an E-Mail client, a grown-up word processor like Apple’s Pages, or a mind mapping tool like iThoughts. Markdown is a plain text formatting syntax designed so that it can optionally be converted to HTML. Markdown is popularly used as format for readme files, or for writing messages in online discussion forums, or in text editors for the quick creation of rich text documents. Markdown works with special characters like *italic* or **bold** to format text as italic or bold. Sometimes it’s worth to take a quick screenshot of an information. Then, if you want to quote, you need a text recognition application which allows to convert an image into text. The far best app is Prizmo. 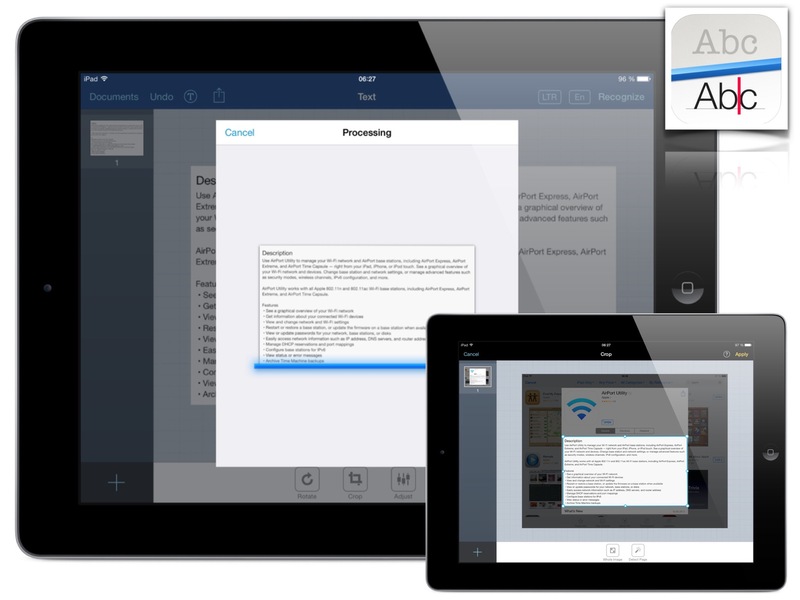 Prizmo supports syncing via iCloud so that screenshots or photos made with the iPhone are also available on the iPad to extract text later. Sometimes it’s necessary to scan documents (e.g. invoices of charged accounts, …) with the AirPrint capable HP printer or copy them. 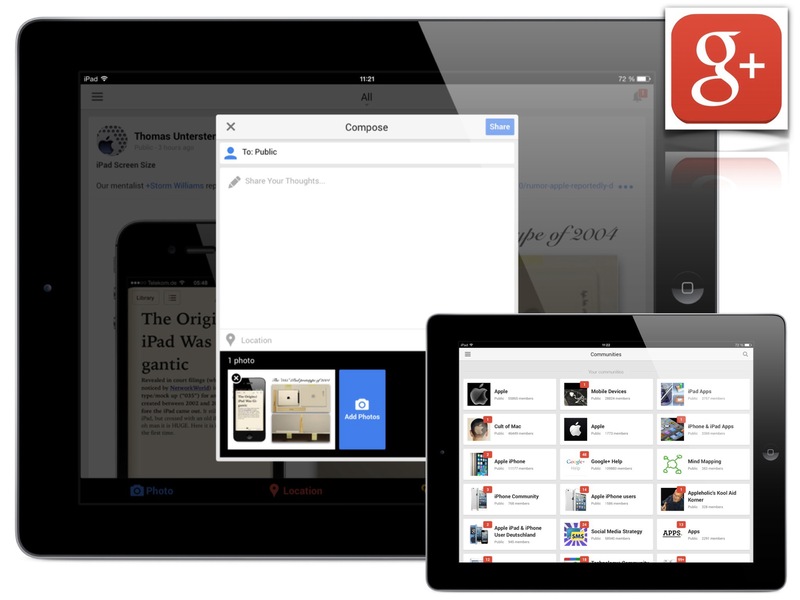 The app also provides file management. 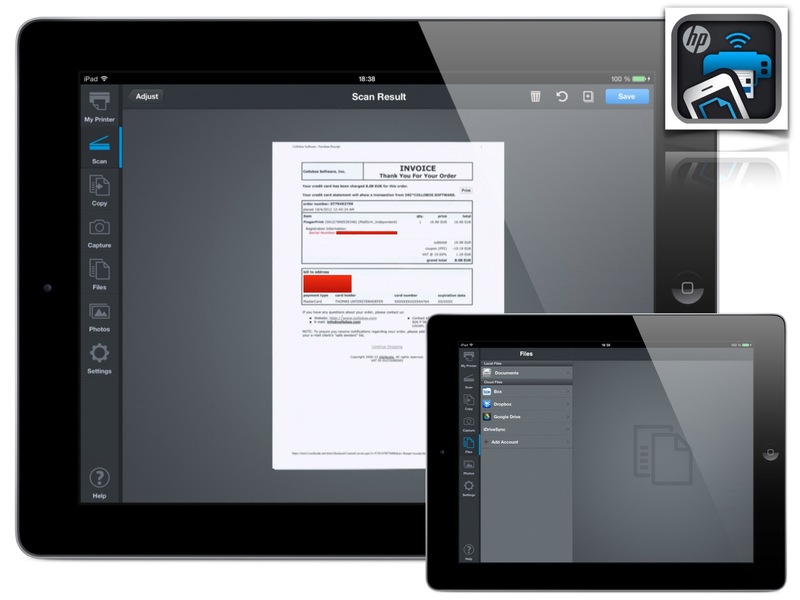 The HP printer can be fully controlled by the app. G+ for iOS devices let you publish links to your WordPress blogs on Google+ to quickly extend your audience when posting to appropriate communities. The best app to manage files on cloud storages as well as computers is FileBrowser by Stratospherix, now also supporting Point.IO. By using a VPN connection you can access storages of remote computers in your office. FileBrowser supports the display of Microsoft Office files, Apple iWork files, PDF files, and other well-known formats. For other related tasks the software configuration can be extended by TeamViewer Remote Control (managing the still indispensable Windows PC in the office) and further apps which connect you with other social networks like LinkedIn, Pinterest, Scoop.it, Path, Tumblr, StumbleUpon, Twitter, and Facebook. An additional useful app is the free version ‘PS Express’ by Adobe for some basic editing of images. Blog articles with high quality require intense researches to enable readers to validate your content and for quoting content of other authors. This can be done by using the mind mapping tool iThoughts with it’s integrated browser or by saving links as bookmarks in Safari using a special folder like ‘BlogResearch’. Doing it with iThoughts is the more convenient way if you create the blog structure already with a mind map. 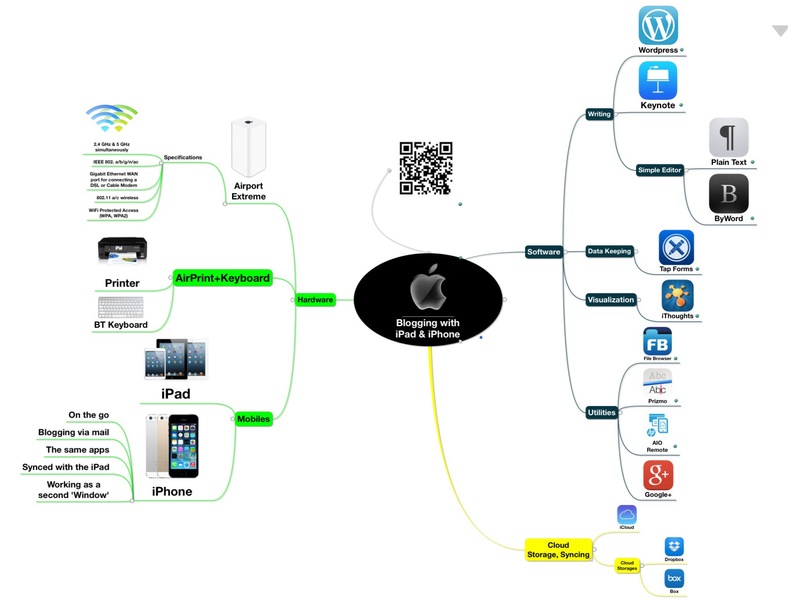 Made with iThoughts for the iPad here is a summary of all compontents I use for blogging. If you use a mind mapping tool you can benefit from links assigned to topics. These topics are marked with a small globe. Tapping on a topic opens the website within the integrated browser of iThoughts without switching to the standard browser. It works but admittedly it would work also with a cheaper configuration when using Android devices. But the price is often not the one and only criterion. In my case it’s the homage to a great visionary, an innovator, and a top influencer of our times. It was Steve Jobs who forced me to join Apple’s ecosystem and start blogging about this fascinating company and the much more fascinating people who made Apple to the most valuable and innovative company in the world (Forbes 2013). The only task which cannot be done with an iOS device is uploading of files to websites like BIGGERPLATE, the mind mapping platform. Thanks for being a loyal visitor on iNotes4You.com.